Lane Bryant fashions are available nationwide at its 775 Lane Bryant stores, and online. Your use of this card constitutes acceptance of these terms: This gift card is issued by and constitutes an obligation of CSGC, Inc., an Ohio corporation. 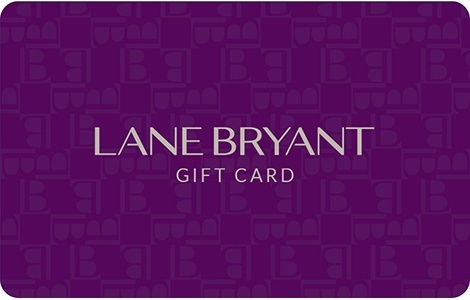 Its value may be applies toward any purchase made at Lane Bryant, Lane Bryant Outlet, or Catherines stores and/or online and cannot be used to make payments on any credit account. Except where required by law, this card will not be refundable or exchangeable for cash and will not be replaced if lost or stolen. Remaining balance is shown on your receipt or may be obtained at any Lane Bryant, Lane Bryant Outlet, or Catherines location. To shop online or find a store near you, visit www.lanebryant.com. Check your balance: 1-800-478-2921.